Here is Gracie with her very own portrait. It was a lot of fun to capture her smiley face. 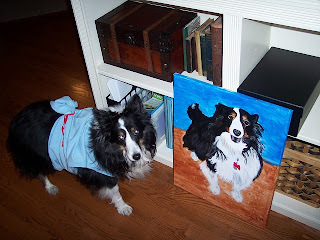 She is wearing a t-shirt to cover her stitches after surgery to remove a few tumors. Dogs who are not spayed before their second heat have a 1 in 4 chance of developing mammary tumors. Mammary tumors have a 50/50 chance of being benign or malignent. Being a puppymill dog means someone else profited while putting her future at risk.